The Creating Community Justice Project was an initiative of the African Community Justice Program, a partnership between the Neighbourhood Justice Centre (NJC), the Brotherhood of St Laurence, Storyscape and Melbourne Playback. The program was based at the African Australian Community Centre in Footscray. The program aimed to improve connections and understanding between the justice system and young African Australians in Melbourne’s inner west. Improving understanding of the justice system. Increasing access to justice for the local African community. The Creating Community Justice Project brought together young African Australians and members of the justice system in the inner west to discuss their experiences of justice and community justice issues. Melbourne Playback used storytelling, performance and games to build trust between the participants and empower them to communicate theirstorieswithconfidence.Theprojectalso developed the participants’ leadership and public speaking skills, allowing them to make a powerful presentation of their work in a way that engaged the justice system. The project commenced with a planning workshop in December 2012, followed by a series of creative workshopsinFebruaryandMarch2013.During these workshops, participants told their stories, created short films (with Storyscape) and developed performance skills. 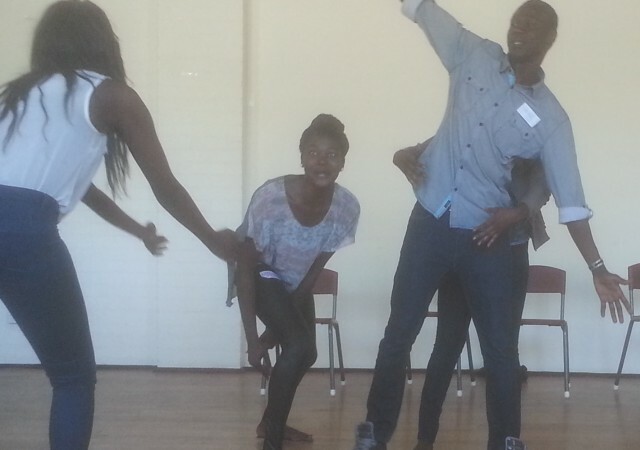 Their work culminated in a performance and showing of the films before Sunshine Court magistrates, Victoria Police, agencies and community members on 27 March 2013 at the African Australian Community Centre. Workshop participants included twenty young African Australians with Sudanese, South Sudanese and Ethiopian backgrounds from the Western suburbs of Melbourne, working together with a Victoria Legal Aid lawyer, Victoria Police officers from Footscray Police station and a Koori Justice Worker from the NJC. Magistrates from Sunshine Magistrates’ Court, senior members of Victoria Police, representatives from justice and other agencies, along with community members, participated in the event on 27 March 2013. The Neighbourhood Justice Centre (NJC) funded and managed the project, working with the African Community Justice Program, Melbourne Playback and Storyscape. break down barriers between the community and the court to increase confidence in and understanding of the justice system. The Creating Community Justice Project played a key role in building the confidence of young African Australian participants to share their experiences of the justice system in a compelling manner and also to share the experience of workers in the justice system. This exchange laid the way to improved understanding of the justice system, increase cultural awareness and increase access to justice for the local African community. Join our newsletter for upcoming events, workshops and exclusive ticket offers.